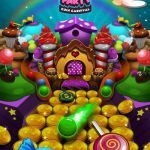 Coin Party: Carnival Pusher is another one of those carnival-style coin pushers that are quite popular among fans of casual mobile games. The game, which promises to be the best ad-free carnival dozer game ever, comes to us from Mindstorm Studios and it’s available for Android and iOS devices alike. 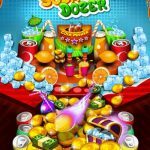 The gameplay is as simple as it is in other similar titles – keep on dropping gold coins onto the dozer, pushing more and more cash your way as you become richer in-game. You can also unlock more pushing powers and dozer tables by completing in-game quests. Additionally, you can trade or spend your prize collections in these quests, allowing you to unlock more goodies, or play the Party Slots mini-game which works like a slot machine and allows you to win more prizes. There’s nothing else to these type of games, really, but you have to remember that the goal of these titles is for you to earn more money. 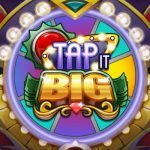 Read on, as we shall now be bringing you some pretty cool Coin Party: Carnival Pusher tips, cheats and hints that can win you more in-game cash, thus making you “richer” beyond your wildest dreams. One quirk of this dozer game is that the pusher doesn’t allow too many coins to be pushed off of the front, as compared to the number of coins pushed to the side. Keeping that in mind, you can try dropping coins five at a time, side-by-side, so you can drop coins faster and get the game moving. You don’t want to do it the long and hard way and drop them one at a time. 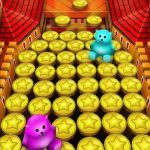 That won’t increase the percentage of coins dropped off the front either, so try to drop as many as possible side-by-side, with five as your magic number to shoot for. You may get impatient waiting for more coins to appear once you’ve run out of them. Fear not, though, as you can simply hit the plus button, which is found beside the coin counter. That’s going to pull up an ad video, and once you’re done watching the clip, you will earn 20 coins free of charge, per video. But regardless whether you’ve got a lot of coins, a few coins, or no coins at all, you can watch videos anytime you wish, and as often as the game allows. Interestingly, watching videos makes virtually anything in this game free of charge. You can head over to the coin shop and watch more videos, as you earn more coins, gold bars, bucks, spin tokens, and potions (yes, they’ve got potions in this game) without having to part with any real-life or in-game money. As a bonus tip, tap on the flying treasure boxes as you play the game and you can earn those very same items without having to pay. Wondering about the potions we told you about in the above tip? You’re not the only one. These potions facilitate your power-ups, but you should make sure that you’re using the right power-ups in the game. Usually, that will be the coin cannon, as it works by sending your coins falling from the front, right down into the pit, instead of from the sides. The other power-ups such as the coin shield are fine, but the mega dozer, unfortunately, is pretty useless. It simply makes majority of the coins fall off the side unless you’ve already got a coin shield active. So if you do plan to use the mega dozer, activate the coin shield before proceeding any further. 5. Why Should You Bother With The Quests? In the game description, Coin Party: Carnival Pusher promises some quests for you to complete, so that you can win some prizes. You can access them by going to your prize table to check the items that need to be collected, and collect those required items by dropping them off of the front of the pusher. Completing one prize table will open up new prize tables, and you may even end up winning some premium currency, such as gold bars. This would be our collection of tips, tricks and cheats for Con Party: Carnival Pusher. In case you know other hints, that we haven’t mentioned in this guide, please drop us a message in the comments section below! How or what do you use the diamonds for ? They are supposed to be for going from one quest to the next but there are only 8 quests so it seems foolish for them to keep giving them.i have like 12000 now lol.